The University of Central Lancashire (UCLAN) has won two awards at the Broadcast Journalism Training Council's (BJTC) 2008/9 training awards. 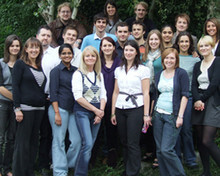 The university's journalism school, whose 2008/9 broadcast journalism class is picture, took the 2008/9 Course Award for "general excellence in broadcast journalism training". UCLAN broadcast journalism student in 2008/9 Tom Hourigan was named winner in the Short TV section for a piece about dog that could diagnose cancer. UCF student Nina Saada won top prize in the TV Documentary category for her film on human sacrifice in Uganda, shown below, which was praised by BJTC secretary Jim Latham as a "stunning investigation worthy of international coverage". Saada is now working for NBC's London Bureau. The University of Winchester's BA Journalism programme won the Course Innovation Award. Entries are currently open for the 2009/10 BJTC awards - more details are available at this link.